The LG 32GK650F provides high-end specifications in a large, 32-inch screen that’s designed to impress and immerse its users. This model is almost identical to the more expensive 32GK850F in looks and performance, but HDR compatibility isn’t part of the package. The LG 32GK650F is a very attractive option at its price point, but what kind of numbers can it produce? The LG 32GK650F sports the brand’s latest gaming monitor aesthetic which uses matte black plastics heavily along with some red accents. This results in a modestly proportioned and clean-looking product that doesn’t betray the gaming genre while still looking like a signature LG model. We love that the display is bezel-free on three sides so you can enjoy the large view space. 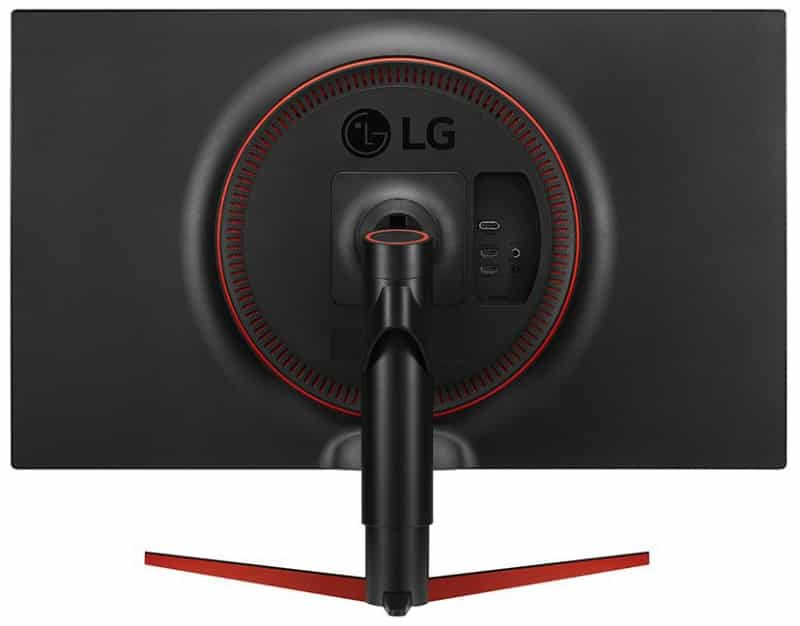 We also like that LG is now placing their OSD control joystick at the middle of the bottom bezel. Doing it this way makes it more convenient to calibrate the monitor since you don’t have to reach all the way to the rear of the chassis. Build quality is amazing thanks to LG’s quality manufacturing processes which has been very reliable in recent years. The device doesn’t feel wobbly or fragile despite the cabinet’s modest depth. The plastics used feel very nice to the touch plus there is no sign of warping or uneven seams anywhere on the product. The most distinct aesthetic feature of the LG 32GK650F is the decorative ring at the rear which is laced with vent holes for the innards. There is no RGB Sphere Lighting installed like on the 32GK850G, so you are stuck with the black and red look which has gotten old for some users. The red ring circumnavigating the vents are not removable, but we reckon its easy to paint it if you have steady hands. The LG 32GK650F is supported by a sleek telescopic stand with a penguin feet styled base. The mechanism offers tilt, swivel and height adjustments, but you can’t use this monitor for portrait setups. This part is also removable to reveal VESA holes for use with aftermarket mounts. 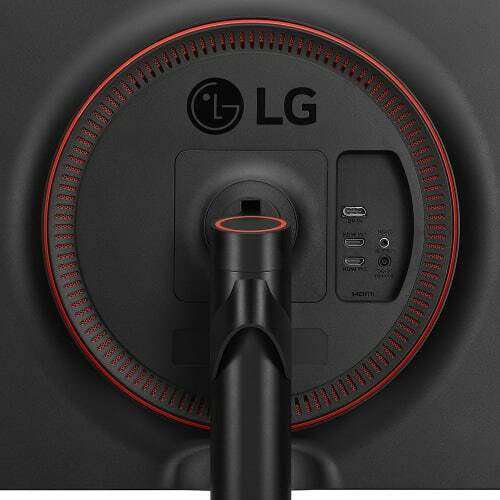 You will also find the LG 32GK650F’s connectivity panel right next to the stand’s attachment points. The layout includes DisplayPort 1.2, dual HDMI 2.0 slots for video inputs, but there are no USB connectors. There are no speakers, but that’s forgivable since you are better off with a separate set anyway. The LG 32GK650F sports a 32-inch VA panel with a 2560 x 1440 resolution, 144Hz refresh rate, and 5ms response time. A contrast ratio of 3000:1 is specified along with a 5ms response time which can be reduced to 1ms via MPRT. The almost perfectly identical 32GK850F has the same specs, but it has a few tricks up it sleeve compared to this model. The first characteristic of the LG 32GK650F you will notice is its slightly looser pixel density of 93 PPI. 1440p is much more suited for 27-inch offerings, but the sharpness and detail it provides will still be noticeable in this model. QHD monitors are easier to run compared to 4K plus they also present the perfect balance between detail and speed. The LG 32GK650F is able to produce an impressive 118% of the sRGB gamut but with poor accuracy of Delta E 3.2. The display looks like it was tuned to pump out more colors than making images as lifelike as possible. You can improve accuracy to DE 1.7 if you have access to a colorimeter, but buying one for a dedicated gaming monitor is pointless and impractical. The resulting color temp from the LG 32GK650F’s factory tuning is also slightly off which makes the screen a bit cooler than sRGB-tuned models. Gamma is also slightly off at 2.3, but it adds a nice noire to the screen which helps colors and shadows pop. This model is one of the least color-accurate in the brand’s entire line up, but it was not meant for professional applications. Another contributing factor to the LG 32GK650F’s suitability for vibrant games is it’s excellent 3100:1 contrast ratio. This characteristic creates deep blacks and superb color separation and definition, so visuals and effects really pop out. It also helps that the brightness sits at a comfortable 360cd/m2 which is more than enough for daily use. Panel uniformity is decent for the LG 32GK650F since there are no heavily noticeable imperfections or deviances in color reproduction and blacks. The backlight has a slight difference of around 12% on the top corners, but it’s difficult to notice when a game or a movie is on screen. The LG 32GK650F handles motion with aplomb even if it utilizes a VA panel which is known to be slower in pixel transitions. We did not find any cause to use the monitor’s 1ms MPRT feature or Overdrive if 120Hz or 144Hz operation is active. We only recommend activating the 1ms MPRT if you are playing extremely competitive games such as CS:GO. 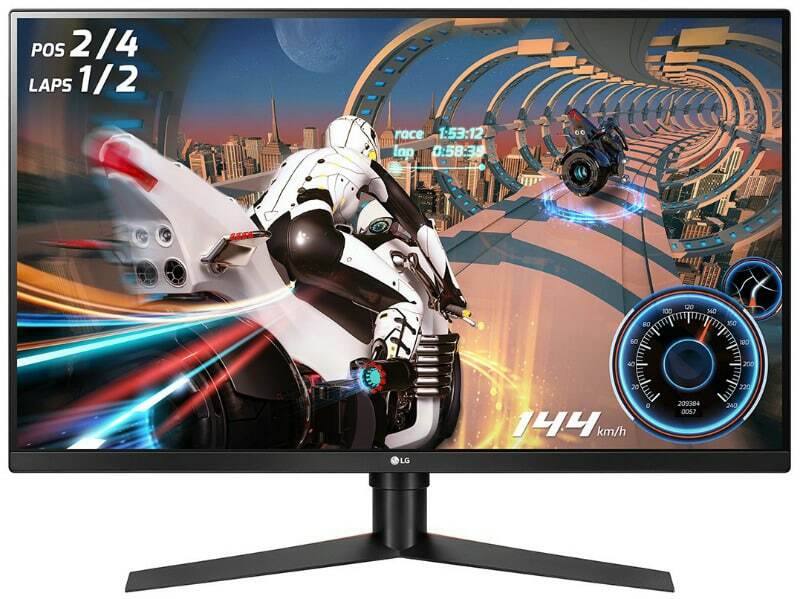 The LG 32GK650F is a FreeSync-compatible monitor with a 50Hz to 144Hz range. It’s also tested to be work with Nvidia’s G-Sync compatibility initiative, so GTX and RTX owners can enjoy buttery smooth frames. This model’s input lag averages at 11ms which isn’t too bad even for competitive gaming. The LG 32GK650F commands excellent value at its current price point if you consider what you are getting. The large, QHD screen with high-refresh rates is a joy to play with despite its shortcomings in color accuracy. We’re also glad that motion handling and input lag aren’t an issue even if the brand included solutions for it in the OSD. The LG 32GK650F is the better buy compared to the 32GK850F if you are only looking to game and emulated HDR isn’t part of your requirements. It’s a decent 32-inch gaming monitor which sells cheaper compared to similar options which usually cost at least a hundred more.